Unpopular opinion, but this commonly criticised NUFC player has done pretty well recently.. – NUFC blog – Newcastle United blog – NUFC Fixtures, News and Forum. 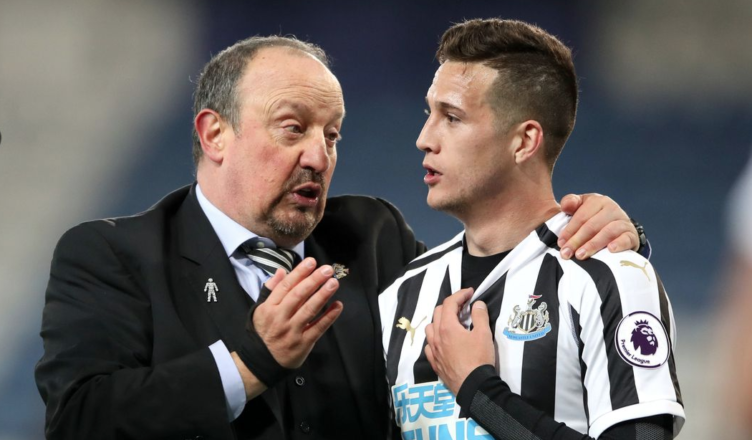 He’s not the answer at right-back and there’ll be no tears being shed on Tyneside if he departs this summer, but I think Javier Manquillo deserves some rare praise. The Spaniard has often looked out of his depth at this level ever since Rafa signed the former Liverpool flop following our return to the top flight, however he’s actually filled in pretty well in recent weeks. Not only did he put in a solid performance in the 1-0 win at Leicester last week, dealing with the threat of Chilwell and Barnes impressively, he’s been part of two clean sheets and two wins in his last three starts – with him being one of the better players in a bad bunch in defeat at West Ham. Nor he or Yedlin are the answer at right-back moving forward – they have their limitations at both ends of the pitch and have a tendency to switch off- but Manquillo will be pushing for another start ahead of Saturday’s home game against Southampton, and rightly so. On the subject of Southampton, the bookies are struggling to split the two sides ahead of Saturday’s game – and it’s easy to see why with our recent rise to form at St James’ Park and the Saints’ impressive surge to safety in mind. That said, I fancy us to win this one after last Friday’s big win, and with promotions at kiwicasinos, it may be worth a pre-match flutter. (3-4-2-1): Dubravka – Schar, Lascelles, Dummett – Manquillo, Ki, Hayden, Ritchie – Perez, Almiron – Rondon. As for predicted goal scorers, it wouldn’t take someone with luck at casino UK online to work out that Salomon Rondon is a good bet to get on the scoresheet, with the Venezuelan almost scoring a third of our 32 league goals this season.